Browning offers full-size safes with a separate compartment for handgun storage. If you own a handgun, you need a safe. Storing your gun in a dresser drawer, closet or on a high shelf won't do, particularly if children are in the home. The only certain way to protect guns from curious sons and daughters, neighborhood children, fire and light-fingered thieves is to buy a sturdy, combination-lockable safe designed specifically for the job. Key-locking safes and inexpensive trigger locks are better than nothing, but keys have a way of getting lost--or found by an inquisitive child. Many keyholes are surprisingly easy to pick. Combination locks or electronic keypads are clearly the best way to go. Losing a gun to fire or theft isn't the only potential problem you face. Years ago, California pioneered legislation making gun owners criminally liable for death, injury or property damage--intentional or otherwise--caused by firearms not properly secured that found their way into the hands of a child or irresponsible adult. In addition to the guilt you'd undoubtedly feel if a gun you owned injured or killed a neighbor--or a member of your own family--you would be subject to stiff fines and possible imprisonment. Most states have passed or are considering similar laws. You can't afford a safe? Then you probably can't afford that new handgun you just bought. Federal legislation now mandates including a locking device with every new firearm sold. While this is a step in the right direction, such devices--which typically feature some kind of armored wire threaded through the action and possibly the bore--are easily misplaced or forgotten. With a little effort and the right tools, most of these inexpensive locks are easy to dismantle or destroy. This Secure Logic safe mounts in the wall and offers rapid access. Many manufacturers now install integral locks on the handguns they sell. While these built-in locks are fine in theory, in my experience almost no one bothers using them--at least not after their novelty has worn off. They also make the gun useless if you have a sudden need for self-defense and can't locate the key. This Smith & Wesson pistol case is manufactured by American Security. Handgun owners can choose from six basic levels of security. The lowest--and by far the least expensive or desirable--is the internal or external lock manufacturers supply free of additional charge. A step up from this is the Child Guard CS100--an extremely robust safety device featuring a patented design that positively withstands tampering. Using pliers, a large screwdriver, hacksaw and hammer, I tried--hard--to break one of these locks open. It resisted my best efforts. The Child Guard lock delivers a high degree of safety at a reasonable $29.95 price. In addition to offering minimal security, inexpensive handgun locks won't prevent your gun from being stolen. Thieves can simply take the gun home, then take their time getting rid of the lock. Once again there's the problem of finding the key in time to keep intruders at bay. The next step up in security is a simple metal box with a combination lock. These boxes are portable, although some have mounting brackets for installation underneath a desk or alongside your bed. I keep a V-Line case containing a LaserGrip-equipped 1911 handy in a dresser drawer. While it won't prevent theft, the box keeps my home-defense gun out of the hands of visiting grandchildren. It provides the same security on family road trips. The mechanical five-button lock takes only seconds to open if someone invades my home. Next comes a fixed-metal box that permanently and securely attaches to a nightstand, bed or some other piece of furniture. Some models can be installed in a car or recreational vehicle. GunVault is one well-known product of this type. Four different GunVaults are available. Standard Mini and Multi models have 16-gauge steel walls and No-Eyes four-finger keypads for quick, easy access. Deluxe versions sport motion detectors with audible alarms, along with interior lights to illuminate the safe's contents. The programmable electronic keypad has a built-in computer that blocks access after repeated invalid entries. An indicator also notifies you of attempts to open the GunVault in your absence. One of my sons has used a GunVault for years and says it's been highly reliable. Taking things up another notch, wall-mounted steel cabinets like those offered by Secure Logic and American Security Products are designed to fit between studs 16 inches apart. Installed in a closet and screened by hanging clothes, they keep guns out of sight, yet quickly accessible. Depending on the model, these can be opened by entering numbers via a keypad or triggering a sophisticated fingerprint sensor. This AC-powered Goldenrod dehumidifier has long been a standard accessory to prevent guns rusting in safes. While these wall-mounted units are pretty much childproof, most won't protect your guns from fire. 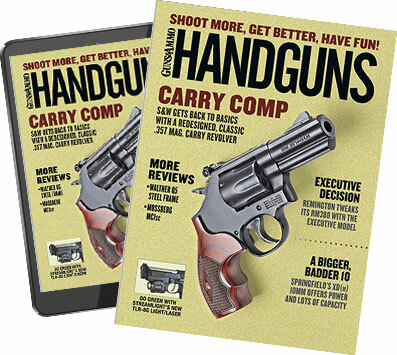 They're primarily designed to keep handguns from unauthorized persons but quickly accessible by you. Stack-On offers free-standing pistol cabinets with pre-drilled holes for mounting to a floor, ceiling or wall--or to another Stack-On cabinet. These modestly priced units are fitted with conventional key-operated locks. Stack-On's more robust free-standing safes come equipped with combination locks. Nosler now offers full-size gun safes. If fire is a concern, you'll need to invest in a heavier safe offering some degree of fire protection. American Security (AMSEC) offers a sturdy wall safe with a 5/8-inch-thick door and a one-hour fire rating. Stack-On's personal fire-resistant safes are similarly UL-certified to withstand a full hour of 1,700-degree temperatures without allowing temperatures inside the safe to exceed 350 degrees (paper chars at 450 degrees). Notice I didn't say fireproof. I'm not aware of any gun safe that claims to be fireproof. Small, lightweight personal safes like those I've mentioned provide a minimal amount of fire resistance, if any. For your guns to have really serious protection from fire, you need a heavy, full-size safe. The ability to keep contents reasonably safe from burning varies widely with model and price. Light handgun cases like those V-Line offers, quick-access GunVault safes and most cabinets that mount flush with the wall guard against children or theft but offer nothing in the way of fire protection. On the other hand, handgun-size safes from Stack-On, AMSEC, Cannon and others offer fire protection varying from 40 minutes at 1,200 degrees (the temperature of the average house fire) to two full hours at 1,850 degrees. Gun Vault's mini pistol offers No-Eyes rapid access. These relatively small safes are great for protecting handguns, but if you're like me, you also own your share (or more than your share) of rifles and shotguns. That makes full-size gun safes the obvious answer. The interiors of most large safes are highly customizable. Add a shelf or two above the space long guns occupy and you can keep all your firearms secure in a single location. Some gun safes are sufficiently commodious to house up to 50 long guns. My Fort Knox safe has this capacity, while a pair of shelves provide sufficient room for a couple dozen handguns (more if they're stacked in factory boxes). My Weatherby safe is slightly smaller. It's configured to hold 26 long guns--13 on either side of a center console that holds up to 20 boxed pistols and revolvers. Two additional shelves overhead offer at least that much extra handgun storage. Hooks and hook-and-loop fasteners can be attached to some safe doors for even greater handgun capacity. Full-size (and larger) safes offer the maximum in firearm security. They're far too big, bulky and heavy for a thief to drag away. Such safes typically have thicker walls, better locks and sturdier locking bolts. Pry-resistant doors, drill-resistant plates over the locking mechanism and internal hinges effectively deny access to the most determined burglar. Be aware that not all full-size gun safes are constructed with fire-resistant linings. Check the specifications before you buy one. Safes are rated for varying levels of fire protection. It's not an infallible rule, but the heavier and more expensive a safe is, the more fire protection it's likely to offer. The author's son James uses a wall safe hidden in a closet to keep handguns safe but handy. I sleep better at night knowing my guns are protected by the two full-size safes I own. I'm also more relaxed when I have to be away from home for several days. Those safes are roomy enough to also hold some expensive binoculars, cameras and other valuables I own. Handgun-size safes don't have a lot of extra room. This Slim V-Line Closet takes up little floor space and features handgun hangers on the door. While large "do everything" gun safes have a lot of appeal, some dislike swinging open a ponderously heavy, vault-like door simply to remove a handgun. Stack-On, Browning and other companies have addressed this issue by providing a separate compartment with its own door at the top of the safe. This makes accessing handguns easier and more convenient. While gun safes are designed to protect against fire and theft, flooding has only recently been addressed. Recalling recent events in New Orleans, Florida and other flood-stricken areas, I applaud Sentry Safe's ProStaff gun safe. A sample of this safe was displayed at the 2006 SHOT Show in Las Vegas, where it sat in a clear plexiglass tank half-filled with water. An independent testing firm, ETL Semko, has certified these safes will keep guns dry in up to two feet of water for as long as three days. Living on a flood plane or near the ocean isn't the only reason your guns may be at risk from rising water. Several years ago an early spring runoff entered the basement windows of my home. A foot of muddy water ruined a large, new carpet and warped wood-paneled walls. I was glad I'd located my gun safe on the second floor. According to the Insurance Services Office Inc., flooded basements, burst pipes, overflowing clothes washers or water heaters that give up the ghost cause some of the most common insurance claims. Cannon offers several full-size safes in its Traditional lineup. In addition to keeping your guns high and dry, ProStaff safes offer ETL-certified protection against 1,400-degree conflagrations for up to a half hour. If you're not concerned about flooding, water in another form can be an even more insidious threat to your guns--rifles, shotguns and handguns alike. I live in dry, desert country, where rust isn't a serious problem. My oldest son makes his home in Austin, where humidity is pervasive. When he noticed rust forming on a couple of his prized guns--including a Browning A5 his late grandfather set aside for him on the day of his birth and a SIG-Sauer .45--he called me for advice. r his precious Browning. I also sent him an Inhibitor safe plug to keep his other guns protected. Offered by Van Patten Industries, these Inhibitor products emit chemical vapors that effectively prevent corrosion. I keep an AC-powered Goldenrod dehumidifier in my Weatherby safe and a couple of Inhibitor plugs in my oversize Fort Knox safe. I haven't encountered much rust with my own firearms, but why take chances? Smaller plugs and Inhibitor chips are available for handgun safes. One problem with keeping all your guns in one or more full-size safe is that these safes are so big and heavy, they're often located in a basement, garage or some other room with a concrete floor. The guns are secure but out of reach if you need one in the middle of the night. The answer is to have at least two safes--a full-size model to hold both long guns and handguns and a smaller safe to secure a loaded handgun near your bed. I figure I'll hear an intruder breaking a window or door in plenty of time to get my 1911 out of the quick-access safe I keep it in. I take safety an extra step further: Instead of storing the pistol cocked and locked, I keep it in the safe chamber-empty, with a full magazine partially inserted in the grip. It requires only an extra second to slam home the magazine and work the slide. Then I turn on the power to the LaserGrip sight I installed a few years back. A high-intensity SureFire flashlight is in the same safe. I remember those early days when I didn't own a gun safe, and I shudder. My three sons were constantly drilled in safe gun handling. I always had a lot of guns around and regularly took my children to the range. Guns were so commonplace, curiosity wasn't a real factor, but that wasn't true of other children who visited the home. I took pains to keep my guns stored well out of reach of my sons and their friends. Still, I worried about accidents and never rested easy until I acquired my first safe. Gun safes aren't a luxury. They're an absolute must--particularly if you have children at home. Even a simple locking cabinet provides a comforting degree of security, while larger, sturdier safes are proof against both fire and theft. If you own a handgun--or a firearm of any kind--you can't afford to be without a safe.